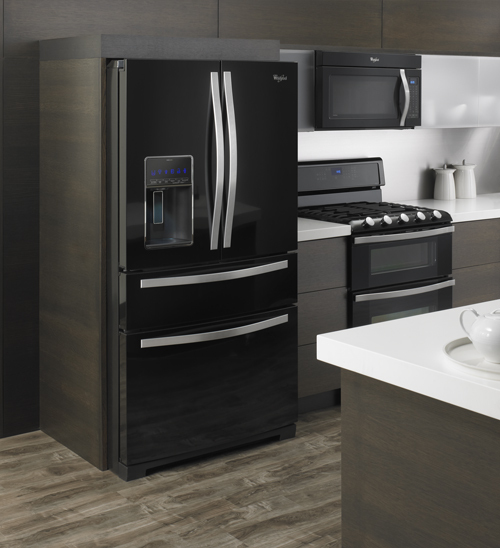 While at CES 2014, I had the opportunity to learn more about the new Whirlpool innovations. The concepts are exciting because they will not only add more functionality and control over my kitchen but also enable me to be more productive. Listed below is a summary. 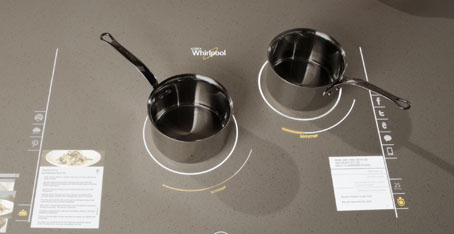 Interactive Cooktop: One of the most exciting demos was of the Whirlpool interactive cooktop concept which turns a simple surface such as a cooktop into a multi-functional information, cooking and entertainment space. For example, while I can cook anywhere on the surface I can also browse the internet to pull up a recipe to view on the same surface! While entertaining, I can cook while checking the guest list online. Combing the functionality of a cooktop with digital connectivity will enable a busy mom like myself to be much more productive in the kitchen. With three “always hungry” boys I spend lots of time in the kitchen so I need all the help I can get! The Interactive Cooktop concept would also allow me to have less devices in the kitchen but still have access to digital connectivity on capacitive touch surface or hands free when needed. Connected Appliances: Whirlpool also introduced a digitally integrated suite of appliances and smartphone app that would not only give me more control in the kitchen, but also on the go. Because my appliances would be connected via a WiFi network, they can be controlled via a smartphone. This would allow me to do things such as saving energy by using my smartphone to run my washer during the right time of day, even if I am not at home. 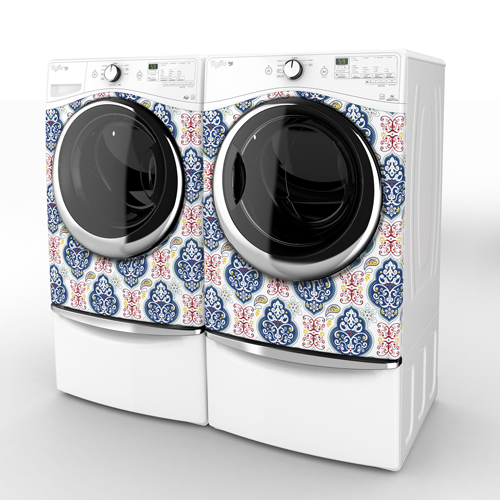 Designer Duet Series: The Whirlpool Designer Duet series goes behind the simple solid colors to allow for personalization such as paisley or chrome bubbles. This type of customization is exciting because it would enable me to bring some stylish touches into my laundry area. The Duet series also has technology to help whoever is doing the laundry (hint, hint to my older sons who need to start doing their own laundry!). The Adaptive Wash Technology in the Duet® washer automatically selects the cycle settings for every load and Advanced Moisture Sensing technology in the dryer prevents over-drying clothes by sensing how long the dryer should run (and also saves energy!). 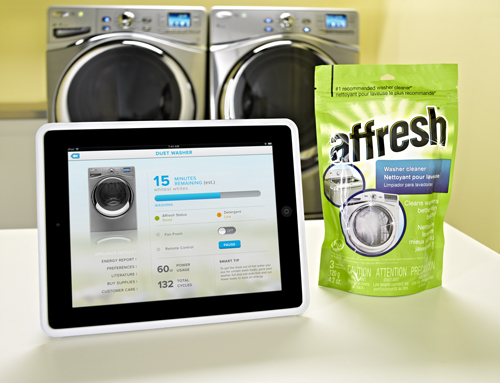 I could even use the Whirlpool WashSquad app to assign laundry tasks to my sons! The CoolVox™ sound system refrigerator concept (available Q2 2014) extends the functionality with wireless Harman Kardon Speakers built in that are not distrupted when the doors are closed! This would allow me to listen to music or podcasts from my mp3 player, tablet, smartphone or computer (Note: “Only one device can be paired to CoolVox™ at a time“). I can also use apps such as Pandora, Spotify or my playlists. Since Whirlpool 20/20 is all about a future focused on you, we, want to hear your ideas for it. Leave a comment below telling us your idea for the future for your home and be entered to win a $1,000 grand prize. Love the CoolVox – learned so much from this blog article on Whirlpool innovations!